I’d been revisiting some of the old recipes I’d blogged about before recently. Sometimes, its because some friends had shared with me a “discovery” or “revelation” about a dish which I knew which prompted me to relook at it. Otherwise, it is simply because I have a craving for it. 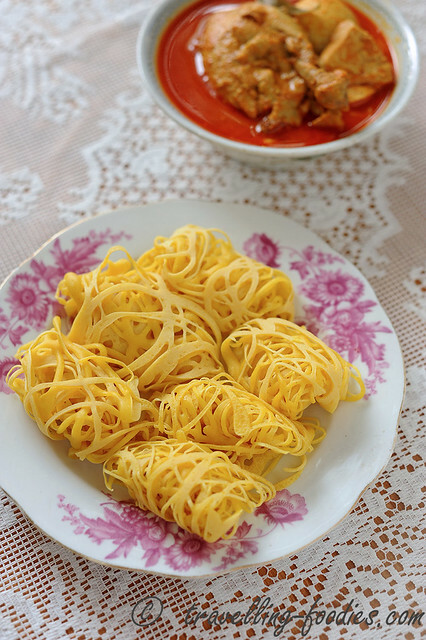 Roti Jala is one of those things which you’d miss eating once in a while. I turned an ayam peksak (poached chicken) from my mum’s semayang see kee (death anniversary prayers) into a pot of kari ayam, the best excuse to make some roti jala to go along. 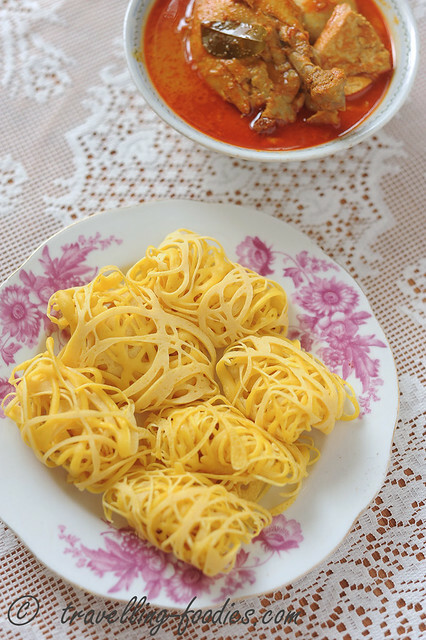 Roti Jala is very easy to make. One doesn’t even need the jala cup mould to make it. Simply take a clean plastic mineral water bottle and poke some holes on the cover with a clean nail and you are good to go! That was precisely what I did today, unable to find my old brass cup mould which is somewhere in the abyss of my storage room. Yes I’m a hoarder! The mould would turn up one day I’m sure but the roti jala can’t wait! The plastic bottle works really well as a batter dispenser! Yes, as promised it is just a short revisit. A revision of the swirling technique, thanks to Nya Tina Tan for highlighting to me a better way of swirling the batter around the non-stick pan. The golden strands look so much better this time. Thanks Tina! For those who are interested to make roti jala and kari ayam for yourself and family to enjoy, below are the recipe links. Let me know how your roti jala turns out! This entry was posted on October 13, 2015 by Alan (travellingfoodies). It was filed under Food, Simple Eats and was tagged with batter, chicken curry, coconut milk, curry powder, fishnet crepes, kari ayam, malay cuisine, Peranakan, Roti Jala, tumeric. 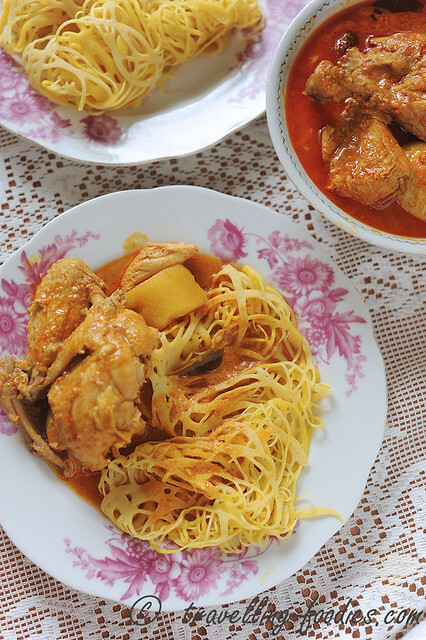 Hi, your nyonya recipes are arguably one of the most authentic on the net. I love all of them. Thank you for sharing with us.